This simple marinade for fajitas takes no time to put together and has been a hit with our family and friends for, oh, about 15 years or so. One of my favorite fajita memories was the time the neighbor we never ever see popped his head over the fence and said "What are you grilling?! That smells fantastic!!!!". If you are a vegetarian, skip the steak and just use mushrooms. There is simply no better way to marinade a portobello for grilling. 1 pound flank steak - do not bother getting the silly "tenderized" version as the texture is most unpleasant. 1 cup aged Balsamic Vinegar from Modena - yes the source is important. Read the labels. 1 4 oz container chopped garlic in olive oil. Measure the vinegar and then the olive oil into the Pyrex measuring container. Dump in the entire jar of garlic. Don't worry about this. The jarred garlic is not anywhere near as potent as fresh garlic would be. If you are a purist and never buy prepared foods at all even simply prepared foods, chop garlic. Shoot for approximately 1/4 cup of the stuff. Twist a bunch of pepper into the container and stir well. Put the steak in one of the zip lock bags. Do not seal the bag. Rinse (yes, I do this right before using mushrooms) the mushrooms and break off the stem if it sticks out beyond the cap. Pat dry with paper towels. Put the rinsed and dried mushrooms into a second zip lock bag. Do not seal the bag. Stir and pour half the marinade into each bag. Turn a few times to make sure that the marinade coats the steak and mushrooms well on both sides. Press out as much air as you can and seal. Place in the refrigerator for anywhere from 1-5 hours. Remove from the fridge about half an hour before grilling. Both grill much better when brought to at least near room temperature. Discard all extra marinade. No need to baste during cooking. Do not use this marinade on shrimps. The balsamic vinegar is too intense. Mindfully enjoy your tender steak and mushrooms nicely sliced and placed lovingly within a beautiful home made tortilla. You can add fresh jalapeno slices if you have a few fresh picked from your garden. Onion slices are fine too - either raw or caramelized with sweet red pepper. Salsa or homemade guacamole are wonderful as well. Put out a bunch of options on the table and let people address their own meal in the manner they find most delicious. What do you get when your garden has the following pepper plants? Answer: about 12 pounds of peppers... so far. Interestingly enough, it is not easy to get people to accept care packages of the habaneros... lovely things though they are ... and they are most beautiful. Everyone wants the sweet banana peppers. So, most of the hot peppers are getting rinsed, dried, and stuffed inside a freezer bag where they now take up about half of my freezers acreage. We had to do something with them so I made some hot pepper vinegar! It's easy and you can use it on any food you would sprinkle with Tabasco. There is simply no need to make bunches of the stuff unless you plan to gift people with these with the understanding that most will not ever sample the goodness, but will instead place them in the kitchen as a decorative item. Clean the containers either in a dishwasher, by boiling them, or in super hot sudsy water (I did the latter and added a pot full of boiling water to the dish pan as the containers soaked. Rinse and dry. Pour the vinegar into a medium sized pot. Set it on the stove. Put on the gloves. Rinse the peppers well. Slice off the stems. Make a slit from top to bottom but leave them whole. If they will be too big to fit into the opening of the container, cut them in half, but they are prettier when left whole so consider looking for a container with a large enough opening. Peel the garlic cloves. Leave them whole... or cut in half, but don't cut them small. With the gloves still on, stick the peppers and garlic into the containers. Alternate colors of peppers - red, yellow, green. Add a garlic clove every now and then. Stuff those bottles full. Dispose of the gloves. Wash hands well. Boil the vinegar. Using the funnel, pour the vinegar into the containers. Do this very mindfully as I do not want any of you to burn yourselves with boiling vinegar. Take great care, ok? Fill only to about a quarter inch of the top. Carefully tap the bottles every now and then. This will help the vinegar get inside the peppers. You'll notice the vinegar level drop in a few minutes. Funnel in more vinegar to raise it to the same level as before. Repeat until the vinegar level stays constant. Allow to cool. Seal and put in your pantry. After a day or so you can start to sample. Depending on what kind of peppers you used and your tolerance to hot stuff, be very careful when you taste. A drop at a time and upward is better than a serious dosing and a flame on mouth. 24 Hours later, we had green beans for dinner. I put a teensy bit of Hot Pepper Vinegar into a bowl and we all touched a green bean to the vinegar and tasted. I used mostly habaneros in our bottle with a dashing of jalapeno, chili, and cayenne. On a scale of 1-10, the sauce was an 11 and totally delicious. 7 Days later, we had a fajita grill out for dinner. I put a teensy bit of Hot Pepper Vinegar into a bowl and we all dipped shrimp into the vinegar and tasted. On a scale of 1-10, the sauce was only a 3 with a sustained warmth that was very pleasing and a nice flavor that very much appealed. I've seen other recipes note that the bottles should be kept out of direct sunlight and it makes sense, so do that. If at any time the vinegar looks a little cloudy or the peppers look funky, dispose of it. You probably have about a million more peppers in the freezer so just make up a new batch. Enjoy this sauce on simple vegetables (it rocked the green beans), chili, tacos, or just about anything you want to zap with a dose of heat. We all have wonderful food memories of the dishes our mother's made when a little comfort was in order. 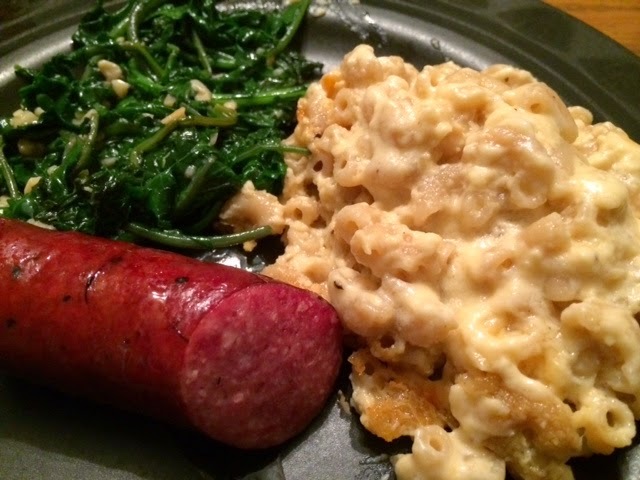 One of my favorites is mac & cheese. It's remarkably easy to make and you don't have the chemical "cheese" taste of a boxed mix. I've updated this recipe to be just a pinch more mindful of fat and sodium. Enjoy. Find out more about this great cheese here! 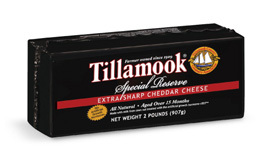 2 cups sharp cheddar cheese - I like a brand called Tillamook and use the Extra sharp Special Reserve. They make cheese in several levels of quality and even the less expensive Tillamook is good. Get the best you can afford. Do not buy pre-shredded cheese. Cheese loses a lot of flavor and dries out within a few days after being shredded. Boil and drain the macaroni per package directions. Combine the cornstarch, mustard, and black pepper in a medium pot. Measure the milk and butter. Open the can of Evaporated milk. Shred the cheese. Measure into two bowls - one with 1 1/2 cups and the other with 1/2 cup of cheese. Spray Pam in a 2 quart casserole dish. Set the burner to medium high heat. Add the evaporated milk, milk, and butter to the cornstarch mix in the pot. Stir well to incorporate. Do not leave the stove for any reason at all. Stand and Stir.When the mixture comes to a boil, continue to heat and stir for one more minute. Lower temperature to very low and stir in 1 1/2 cups of the cheese. Stir until melted. Add the drained macaroni to the pot and stir well. Pour the entire thing into the casserole dish. Top with the reserved 1/2 cup of cheese. Bake, uncovered, for 20-25 minutes or until the cheese melts and the top begins to slightly brown. Serve to children everywhere so they can learn the goodness of real mac & cheese. I used to make this a lot when the kids were little. The recipe has morphed a little since then, becoming more mindful of calories and sweetness and gaining a bit more heat. This is so simple to make, there is no reason to buy that High Fructose Corn Syrup added can of sloppy mix. finely chop the onion and mushroom. Open the can or puncture the lid on the tube of tomato paste and set it near the stove. Measure the chili powder, paprika, garlic powder, and black pepper into a small bowl. Juice the lemon and place in another small bowl with the brown sugar and mustard. Put the oil in a medium sized pot and heat over a burner set to medium. Dump in the hamburger, onion, and mushroom. Saute until the hamburger is well browned and the mushroom and onion soften a bit. Drain very well. Keep the pot over medium heat. Dump in the chili powder mixture and stir well. Top that with the tomato paste and stir well. Add just enough water to make a very thick sauce. Add Tabasco Sauce to taste. Cover and let simmer 15 minutes. Stir every now and then. Remove the cover from the dish, add the mustard mixture, and stir well. Continue to simmer 5-10 minutes. Allow any excess water to evaporate. Stir as needed. Taste and adjust seasonings to suit you. Serve on a bun with cheese or onion slices or potato chips (my son's favorite topping). 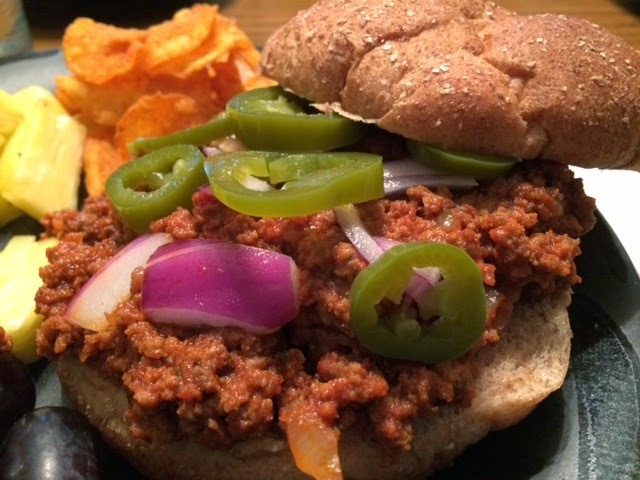 Enjoy this as mindfully as you made it and never buy one of those cans of sloppy joe mix again. Eggs put up quite a fight if not treated with due respect. They fight, they bleed, they refuse to conform to the best intentions of the cook. You can kind of push them back into something that resembles the intended perfection of an over-easy egg... kind of. Defiant eggs stand proudly mangled on my plate, taunting me by proclaiming to the world that "This 'cook' is NOT a good flipper of food." Kind of snotty things, eggs. They were still dratted tasty though! 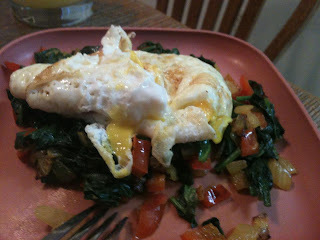 Egg Veggie Mountain should have been two lovely over-easy eggs casually drooling their hot yet still liquid yolks throughout a mountain of spicy sauteed veggies. Oops.